Stories about actresses have been a favoured mode of self-examination for the film industry since the earliest days. Going beyond meta commentaries on the artistic life, the archetype began to stand in for ‘woman’ herself. Fragile yet strong, mysterious yet overflowing with emotions, beautiful and yet ugly, the actress on screen became everything men wanted to say about women, in one alluring bundle of contradictions. As searingly revealing as these portrayals were, with stars like Gloria Swanson, Bette Davis and Gena Rowlands offering up some of their greatest performances, male artists framed and directed the work. Men chose when to move in for a close-up, how to light the face, when to cut away. They chose how ‘messy’ to let things get, and where to end the story. If an actress wanted to say something that was not on the page, she could do so in the subtext, with her skill, but always within a framework established for her by others. 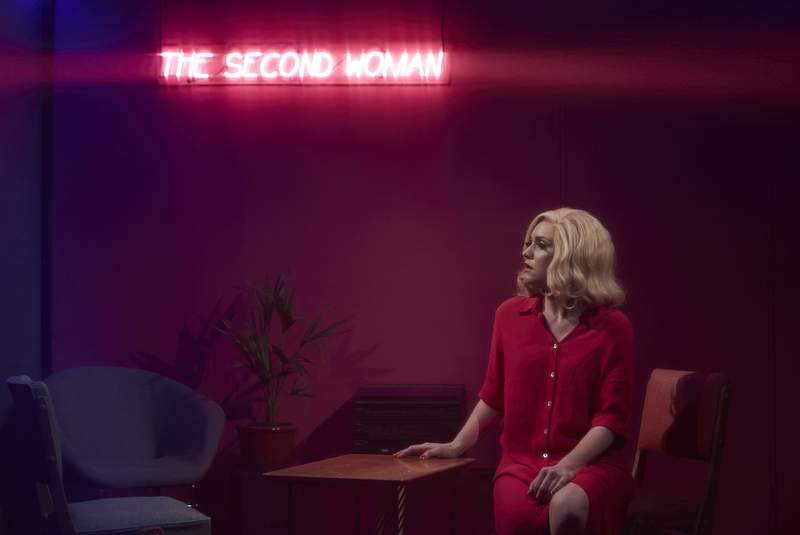 The Second Woman responds to that tradition by placing performer Nat Randall in a box on stage, playing a woman who’s waiting for her lover to visit. A single scripted scene is repeated over and over, with a different man playing the lover each time. The all-female production team, led by Randall and her co-director and co-writer Anna Breckon, includes two camera operators who are live-capturing everything so that it appears on a large screen next to the set. The sound is mic’d so Randall and guest can speak at a conversational level. We are given very little information about the character played by Randall but her glamorous 1960s style (messy yet fabulous hair, perfect make-up) tells us she belongs on screen. As she stands waiting, music swelling, we see her in glorious close-up, glowing with charisma and vitality despite her tortured circumstances. She’s a star. The performance is scheduled to last for 24 hours, from 3 pm Saturday until 3 pm Sunday, but we have no idea if there will be any particular ‘ending’ to it. With a rolling audience of stayers and newcomers, it’s a popular event even in the early hours of the morning. By the time the last hour begins on Sunday afternoon the theatre is packed, with a line out the door of the Arts Centre and onto the footpath. Most won’t get in; there’s no way those inside are going to give up their positions now. There’s a sense of being part of something special. 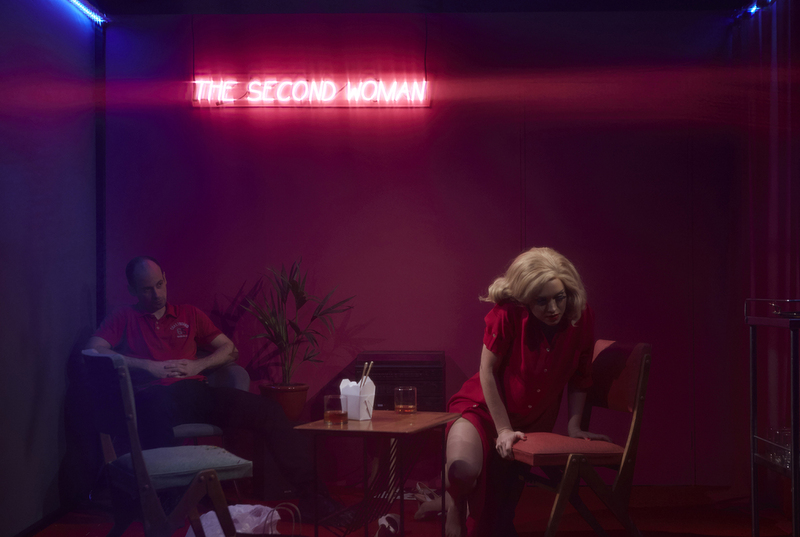 The scene is inspired by lines and characters from the 1977 John Cassavetes film Opening Night, which starred Gena Rowlands as an actress in crisis. The story in The Second Woman is simple but idiosyncratic. A man named Marty arrives to visit a woman, bringing takeaway Chinese food. They talk and drink J&B whisky, although she’s already drunk. She draws him out on his feelings for her (“What a mess I am, begging again”) and he responds, listing some of her admirable qualities. But what she most wants is not something that occurs to him: that he would think of her as “capable.” Frustrated, she throws food at him and turns on the stereo. They dance for a minute to a disco song (“Taste of Love” by Aura), until she falls down drunk and then tells him to leave, handing him $50 that is perhaps for the meal or perhaps an insult (in reality it’s the man’s fee for performing in The Second Woman). They share a final moment and he leaves her alone. To clean up the noodles. To think. To wait. And then it all begins again… with the same words and actions, more or less, but with a new Marty. Short, tall, young, old, suave, awkward, cynical, sentimental; Randall encounters men of many varieties. Some are actors, some are obviously not; with others it’s hard to tell. One wears a suit, one a huge colourful sweater, the next a cape. One man has only one hand. One man brings flowers. One tucks the $50 into his hatband as if to say, “I will make lemonade from the lemons of your rejection.” Each has memorised the same script and is operating from the same set of instructions, although able to deviate in certain moments, such as whether he chooses “I never loved you” or “I always loved you” as his last line. But Randall owns this space. She’s calling the shots, no matter how much her character’s behaviour might imply otherwise, and the audience’s appraisal of each performance is subtly dictated by hers. But this is not a study of subjugation. Acting doesn’t work like that. For something interesting to happen — something usable, in film terms (although that’s a complicated notion here, where every ‘take’ is shown and has an intrinsic value) — there must be mutual trust. Even the most unlikely of acting partners must be taken seriously, his oddest choices honoured, or it all falls apart. Randall is the star of the show, but it’s also her task to allow each man who enters the room his moment to be seen. In this, and in the careful calibration of her own performance in response to each scenario, she excels, never losing sight of what is being created. There’s a discipline to this work that can’t be easy to maintain in the face of exhaustion and in front of a festival audience looking for a good time and not always capable of appreciating nuance. Even from the first few iterations of the scene on Saturday afternoon there was laughter where none seemed particularly warranted (maybe some of the audience knew the men on stage, maybe they’d already started drinking) and by the time day turned into night a carnival atmosphere took over, with cheers and laughter flowing freely. By around two in the morning things got a little wild. T-shirts were torn off, dancing got sillier, noodles were flung more exuberantly. The men on stage, and the men in the audience, it has to be said, became increasingly competitive. When a man seemed to win over Randall, and win over the crowd, it became a badge of honour. “That’s our boy, a fine ragout,” I heard a guy in the audience say proudly at one stage. Later, another man waiting for his own performance timeslot muttered to his friend, “This is my moment. I’m scared now though. How do I follow Diamond Shirt Guy?” How indeed. In-jokes developed: how weirdly will she eat the noodles this time? How could we be surprised by that moment where she totters in her high heels again? The cult of The Second Woman grew at an astonishing rate. By noon on Sunday it would have hardly been surprising to go out into the foyer to find festival-goers wearing “What a mess I am” T-shirts and swigging from ironic bottles of J&B. But through all the fun Randall and team, led by Breckon behind the scenes, maintain the integrity of their experiment. Patterns emerge. We see that the same moments — the paying of a compliment, a kiss on the cheek, the slow dancing — are uncomfortable for many of the men. Some of them struggle to express emotion of any kind, and we recognise how vulnerable they are. We begin to understand their attempts less as good or bad acting, but as either honest or dishonest. We’re not looking for gimmicks, we’re looking for something elusive and yet irrefutable. We’ll know it when we see it. Hence the work’s addictive quality, and the danger of binge-watching. (Thought you’d drop in for half an hour? Why not stay for six?). The Second Woman offers a fascinating insight into craft. You’d be hard pressed to find a film about filmmaking, for example, that so cleverly takes you inside the experience of directing (although the show’s live vision-switching can only roughly approximate actual editing). On a deeper level, it’s an exploration of the barriers of behaviour that divide us as human beings, and those too rare, brief moments when we let them go. The work’s feminist perspective allows us to challenge our preconceptions. Could it be that it’s more powerful to ‘beg,’ after all, than to stay silent and ask for nothing? And, oh yes, the ending. The final Marty is the only female Marty. She brings champagne, and she pours it out too quickly so they have to drink a lot of froth but they enjoy it and the scene is strange and tender and undeniably something. Only some of those watching know that this is Anna Breckon, Randall’s partner as well as collaborator. It doesn’t matter. The audience, by now, is well versed in paying attention to important things that remain unspoken. And as they stand to applaud they’re happy because their actress is happy and can finally rest. And that last bit sounds like a dream but it really happened.